← Fr. Z endorses idea from NcFishwrap. Sky to Fall. Lord to Return. Film at 11. For Vespers at St. Paul’s Outside-The-Walls nearly all the cardinals wore their birettas while seated. They should do it over. Here is no frills vespers for today’s Feast of the Conversion of St. Paul from the Breviarium Romanum. Follow along, even with English side by side, here. I watched some of this on EWTN. (It’s being rebroadcast now.) That’s Cardinal Justin Rigali, former archbishop of Philadelphia, without his beretta. Perhaps Cardinal Rigali has his beretta concealed under his rochet. Could be anywhere. But it’s not on the top of his head. If you’re talking about a baretta, the usual custom is on the shoulder. A wonderful and generous gift, Father, these podcasts of Vespers. Initium sapietiae timor Domini. I think I see Bishop J. Terry Steib in the fourth row, second seat from the left. And after we get all the cardinals to wear their birettas, maybe we can start working on the bishops, NONE of whom seem to be wearing theirs! Actually, that would be Fred on the shoulder, and (Tony) Baretta under his feet. Traditionally, the custom is to wear the biretta upon entering and during the psalms, uncovering at the Holy Name, the doxology, and the name of the saint during antiphons, and while standing during collects and the incensation. No need for a do-over here. What problem do you see? The bigger question is, why aren’t the bishops wearing their birettas? It isn’t like the biretta is reserved for the cardinal. I wonder if any of them are wearing Berettas as well? The various vestments would provide total concealment, so it would be impossible to tell, but still I wonder…. Interesting that Archbishop Piero Marini, who was also there, I don’t think I have ever seen him with a biretta. I watched most of the service via EWTN’s website (when it wasn’t ‘freezing up’–aargh, how I hate it when it happens! ), and I did see the Cardinals. Funny, I wasn’t thinking about their birettas. 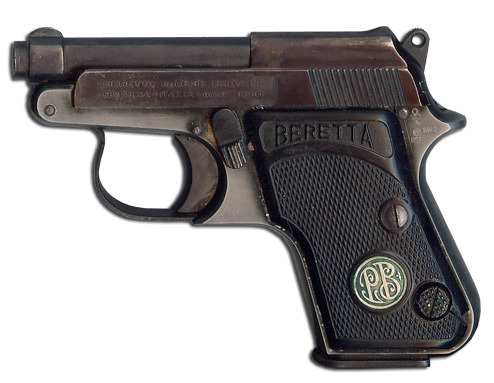 Oh, man, the constant punning between ‘berettas’ [the gun] and ‘birettas’ [the cap] make me want to giggle….or at least grin silently….